In our accelerated world it has become usual to collect developments from several distinct research groups on a same subject and compose it in a book. There is a lot more chance to fit this cooperative action in the usual available time schedule of authors and editors. It will not exactly substitute a lecture book intended to support a course, but it will be a unique chance to gather an insight in results that reflect the state of the art of that area. It is full merit of the editors to offer a uniform prospective, that will juxtapose results from groups of different origins and countries covering the area that gives name to the book and in spite of being heterogeneous in nature will give a homogeneous view on the way problems are handled. 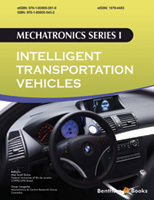 Focusing on intelligent transportation vehicles the editors Dutra from Rio de Janeiro (Brazil) and Lengerke from Bucaramanga (Colombia) organized the work in 9 chapters, with authors from Spain, Mexico, U.S. besides Brazil and Colombia. They work in research groups in Universities, Industries and research centers. The chapters reflect the modern tendency of a higher level of automation of processes and handles aspects of traffic information and vehicle communication, including motion planning, localization, clustering techniques, control of automated guided vehicles and task control, besides examples of a fire fighting robot and route planning in intelligent warehouses. The text is made more accessible as research papers in stile and explanations and it is of value to get a good insight in this area of Mechatronics. This reference text collects a series of updated articles on the automation and control of at least four classes of transportation vehicles, namely: vehicles immersed in an urban environment, vehicles intended to operate in industrial environments, vehicles designed to explore unknown environments and vehicles suitable to move under hazardous conditions. Several techniques are presented and tested encompassing a large spectrum of topics from the selection and organization of data till the design of operative algorithms using advanced communication technologies. It is to highlight the impact of the new facilities proportionate by the world wide communication systems like the GPS on the urban traffic control. The design of intelligent vehicle for urban road network is already a concrete promise for the near future. One of the important contributions concerns the development of an algorithm that manages the control of a team of robots used for environmental mapping. The system acquires data from the environment and is designed to optimize information while accounting for uncertainties inherent to sensing devices, robot motion and environment model among others parameters. Despite that the main focus is directed to space technology the same set up may apply to regions of difficult access as in the Amazon region. (Vivek Anand Sujan, Marco Antonio Meggiolaro). Within this same general theme related to autonomous navigation one of the contributions presents a strategy to plan vehicles motions in the presence of static and dynamic obstacles. As a practical application it is shown the how to plan the motion of vehicles in a urban environment avoiding accidents involving other vehicles or persons. (Martínez-García and Torres-Córdoba). The use of modern information technologies is also one of the contributions deserving to be highlighted. The man-machine communication is presented within computational software using the semantic approach. Despite the difficulties to implement a common language compatible with human and machine symbolic interpretation which needs a consistent ontology the results show a considerable advance on the robustness of the new systems. To deal with information surrounded by uncertainty factors or depending on agents interpretation the fuzzy logic is used to put the decision making process within a compatible possibilities spectrum. (David Torres Garrigós, José Javier Samper Zapater, Juan José Martínez Durá). Besides urban vehicle traffic control automated guided vehicles designed to manipulate and transport volumes in a industrial complex have also been considered. The trajectory planning algorithm taking into account the collecting specifications and the best path was developed in house using the very basic information available in the literature. That is no commercial path optimization software was necessary. The solution advanced in the corresponding chapter is important to implement routing strategies for robotic forklifts. The environment is recognized by sensors installed in the vehicle and the system manages to avoid obstacles and collisions. Several vehicles can operate simultaneously increasing productivity. The authors were careful enough to test the algorithm using the Player/Stage Simulator to show its efficacy. (Kelen C. T. Vivaldini, Jorge P. M. Galdames, Thales B. Pasqual, Marcelo Becker, Glauco A. P. Caurin). Another chapter of this book deals with a complementary theme regarding the automated guided vehicle section. Attention is called over the fact that in several practical circumstances as in production chains not only the robotic vehicles are important but all the itens that compose the manufacturing system. It is therefore important to model the system as whole introducing all the production units and to design an intelligent transportation vehicle system. Critical in the process is the definition of rules to avoid deadlock occurrence. A combination of Resource Allocation Graphs and graphs derived from Petri nets is used for deadlock avoidance and trajectory control. (Diolino J. Santos Filho, Francisco Y. Nakamoto, Fabrício Junqueira and Paulo E. Miyagi). New high speed communication technologies are presented supported by IEEE 802.16e. The application proposed deals with inter-vehicular communication. Two protocols are compared for routing control in a high mobility environment. The Optimized Link State Routing has shown to present a superior performance as compared with the Ad hoc On-Demand Distance Vector protocol. It is also noted the growing importance of the Broadband Wireless Access networks and the use of global positioning network for an effective traffic control system. (Raúl Aquino-Santos, Luis A. Villaseñor-González, Víctor Rangel-Licea, Arthur Edwards-Block, Alejandro Galaviz-Mosqueda, Luis Manuel Ortiz Buenrostro). As information is increasing at very high rates and consequently the data quantity is becoming almost unmanageable using the classic tools, other approaches are needed to make the overwhelming number of data useful. Data mining and clustering techniques have shown to be an appropriate instrument. Clustering technique is discussed in the context of traffic control. Using a type of semantic approach the grouping of different traffic events is encapsulated in interurban scenarios. This chapter provides interesting suggestions for future work that will certainly optimize traffic control algorithms. (Silvia Del-Campo Romero, Juan José Martínez Durá, José Javier Samper Zapater). Another approach for planning trajectories is presented aiming the application to traffic control in automated container terminal and automated large scale freight transport. A new algorithm based on a distributed job scheme modeled by an undirected graph representation. The new technique uses the Scheduling by Edge Reversal graph dynamics combined with the graph representation. One of the advantages of the new algorithm lay on the decentralization of the job control allowing for the distributed control to deal with any modification of the due time. (Omar Lengerke, Felipe M.G. França, Max Suell Dutra). Finally challenging control strategies for vehicles operating in dangerous situations that otherwise would threaten human life are presented. In some circumstances the main purpose of an automated vehicle requires a free path strategy rather than a planned trajectory. This is the case for instance of fire fight robots. Identification of obstacles and rescue targets in an aggressive environment without any well defined data set is better obtained by random trajectories. Designing the control system with chaotic characteristics may serve this purpose. This new technique testing chaotic controllers is explored in the last chapter. The results are compared to find which one covers more efficiently the area to be surveyed. (Magda J.M. Tavera, Omar Lengerke, Max Suell Dutra). Another very important characteristic of this book is to disclose a potentially very rich research network concerning automated vehicles and robots with basis on different countries. I believe that this is not a minor fact to be noted but a proof that science and technology is closing the gap among different countries. The editors were certainly very careful to gather such a high level group of contributors and to propose a topic that is growing in theoretical and practical importance. I cannot finish this foreword without saying about my contentment to be writing this short foreword for a book whose one of the editors, Prof. Dutra, was a student in my class dealing with the introduction to robot dynamics some years ago. I am proud to see him as a recognized researcher contributing effectively to the development of science and technology and the education of the new generation. Carr. Tijuana-Ensenada #3918, Ensenada, B. C.